Depending on what kind of a kid you were, back-to-school was either the best or the worst part of the year. Maybe you were elated by the smell of freshly-sharpened pencils, or perhaps you were the type to lay awake at night just dreading the impending arrival of the school bus. Either way, now that you’re an adult and learning is no longer mandatory, it’s a whole new ballgame — a lifetime of learning is an option, which means you get to make your own homework. Don’t let the little ones have all the fun this fall; instead, commit to bettering yourself, growing your business, and boosting your creativity. 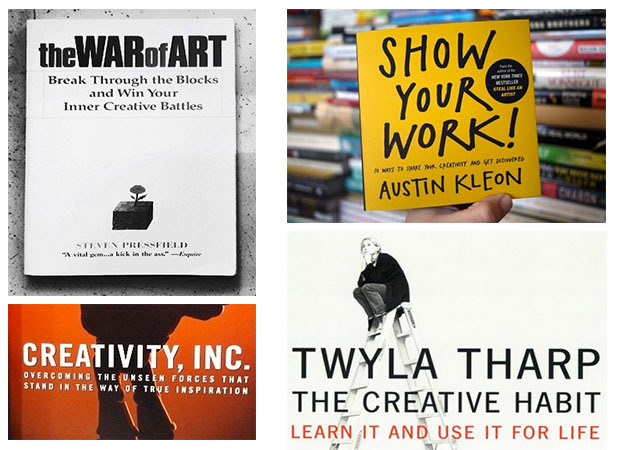 And what better way to do it than to read up on some of the most influential, intelligent, and inspirational books for creative professionals? Contagious: Why Things Catch On, by Jonah Berger: Everyone and their boss wants to make something “go viral” these days — but what does that even mean? And, moreover, how does it work? Wharton marketing professor Jonah Berger combines research and common sense to explain why, exactly, some things get shared like crazy — and why good content gets completely ignored. Not sure about the book? Watch his Google Talk on the matter and then decide. The War of Art, by Steven Pressfield: All creative people feel, at some point, like they have more war stories than actual accolades or achievements to point to. Steven Presserfield can help you get through those times. “The War of Art emphasizes the resolve needed to recognize and overcome the obstacles of ambition and then effectively shows how to reach the highest level of creative discipline. Think of it as tough love . . . for yourself,” writes Steven. Letters to a Young Artist: Straight-up Advice on Making a Life in the Arts-For Actors, Performers, Writers, and Artists of Every Kind, by Anna Deavere Smith: Need some real-talk to get your fire lit? Anna Deavre Smith is the prescription. “I am trying to make a call, with this book, to you young brave hearts who would like to find new collaborations with scholars, with businesspeople, with human rights workers, with scientists, and more, to make art that seeks to study and inform the human condition: art that is meaningful,” writes Anna. Dive deep into this book to regain your confidence and get your creative life underway. Creative Confidence, by Tom and David Kelley: Both of the brothers Kelley have impressive resumes — Tom is the author of the bestselling The Art of Innovation, while Davis is the founder of IDEO and the creator of the Stanford d.school — and together, they teamed up to create this book, which is a hearty reminder that literally every person (not just those of us who call ourselves “creatives”) can make beautiful, cool, useful things. Just Kids, by Patti Smith: In her first prose piece, singer-songwriter Patti Smith detailed her relationship with legendary (and controversial) photographer Robert Mapplethorpe. The book was awarded the 2010 National Book Award for Nonfiction, and was a Publishers Weekly’s Top 10 Best Books, an ALA Notable Book, a finalist for the Los Angeles Times Book Prize, and a New York Times bestseller. One of the most-acclaimed books of 2010, it’s a beautifully-written, intimate peek into the intertwined lives of two cultural icons. The book, which includes 33 questions creatives must ask themselves in order to hone their craft, is a manuscript for a colorful, effective life, and will undoubtedly reignite your creative thought after a summer of taking it easy. Free Play: The Power of Improvisation in Life and the Arts, by Stephen Nachmanovich: Published over two decades ago, Stephen Nachmanovich’s Free Play remains a must-read for those who wish to make their creative pursuit their career. “Any action can be practiced as an art, as a craft, or as drudgery,” writes Stephen — and it’s up to you to decide how to perceive your own. Creativity: The Perfect Crime, by Philippe Petit: Can criminal acts be creative ones? “Man on Wire” star Phillippe Petit asks that question (and more) in this 2014 book, which gained a lot of attention and more than a few accolades. For more information about the film and Phillippe’s daring view of creativity in this blog post. Catching the Big Fish, by David Lynch: Confirmed oddball David Lynch is one of those guys who goes out and makes whatever he wants. A music CD full of strange, dissonant tunes? Check. A litany of freaky-weird films? Got it. So when he published this book — which is part self-help guide, part autobiography — in 2006, no one was sure what to expect. Now, it’s become a must-read for anyone who’s ever dared to making something not because they knew it would be popular, but because they knew it would be different. Creativity, Inc., by Ed Catmull: Pixar co-founder Ed Catmull worked with Steve Jobs and John Lasseter to create a powerhouse in the film industry. It’s “a book for managers, who want to lead their employees to new heights” and “a manual for anyone who strives for originality.” So, basically, it’s for you. Manage Your Day-to-Day: Build Your Routine, Find Your Focus, and Sharpen Your Creative Mind, by Jocelyn Glei: Creatives can have a rough time with logistics, like time management and organization — so when good guidance on those subjects come along, we tune in. Written by 99U’s Editor-in-Chief, this book is all about how to organize your life, without crushing your creative spirit. Contributors include Stefan Sagmeister, Seth Godin, and Dan Ariely. Show Your Work!, by Austin Kleon: Friend of CreativeLive and generally great guy Austin Kleon first garnered a lot of attention in the creative world with the release of his 2012 book, Steal Like an Artist. In the follow-up, Show Your Work!, he delves deeper into the process of creating, and how to get your work noticed. Of course, it’s really a book for everyone who has a product and wants to show it off, without becoming a skeezy marketing person. “This book is not just for “creatives”! Whether you’re an artist or an entrepreneur, a student or a teacher, a hobbyist or a professional, it’s time to stop worrying and start sharing,” writes Austin about the book.